How to use machine learning to create predictive models from biological datasets (RNA-seq and DNA methylation)? Machine Learning is used to create predictive models by learning features from datasets. In the studies Jason G. Fleischer et al. 2018 and Jana Naue et al. 2017, biomarkers are examined to predict chronological age of humans by analysing the RNA-seq gene expression levels and DNA methylation pattern respectively. Different machine learning algorithms are used in these studies to select specific biomarkers to make age prediction. The RNA-seq gene expression (FPKM) dataset is generated using fibroblast cell lines of humans. The skin fibroblasts cells keep damages that happen with age. Epigenomic and phenotypic changes which are age-dependent are also contained in these cells. Within each individual, DNA methylation changes with age. This knowledge is used to select useful biomarkers from DNA methylation dataset. The CpGs sites with the highest correlation to age are selected as the biomarkers/features. In both these studies, specific biomarkers are analysed by machine learning algorithms to create an age prediction model. The datasets from these studies contain features (present as columns). The last column in both the datasets refers to age which is used as labels/targets. Since the targets are real numbers, the machine learning task becomes regression. Using these features and targets, a model is learned using machine learning (regression) which learns a mapping between these features and targets. Using machine learning tools in Galaxy, we can achieve comparable prediction scores as achieved by these analyses. In this tutorial, we will apply a couple of (scikit-learn) machine learning tools to RNA-seq and DNA methylation datasets to predict the chronological age of humans. This tutorial is divided into two parts - one with RNA-seq dataset and another with DNA methylation dataset. In cross-validation, a dataset is divided into k equal parts (k should be at least 2). One part is used as the validation set to evaluate the performance of any machine learning algorithm and the remaining parts are used for learning/training. In both the parts, learning on datasets is done using cross-validation and r2 scoring metric is used to evaluate the performance of the trained model. The closer it is to 1.0, the better it is. If it is negative, then the trained model is not good. To infer how its values exhibit model performance, we can compare the figures 1 and 2. 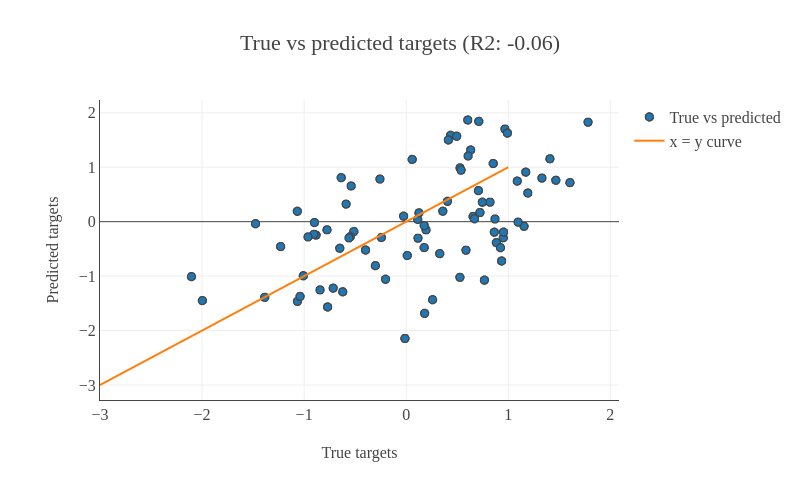 In both the plots, the true and predicted targets are plotted in a scatter plot. 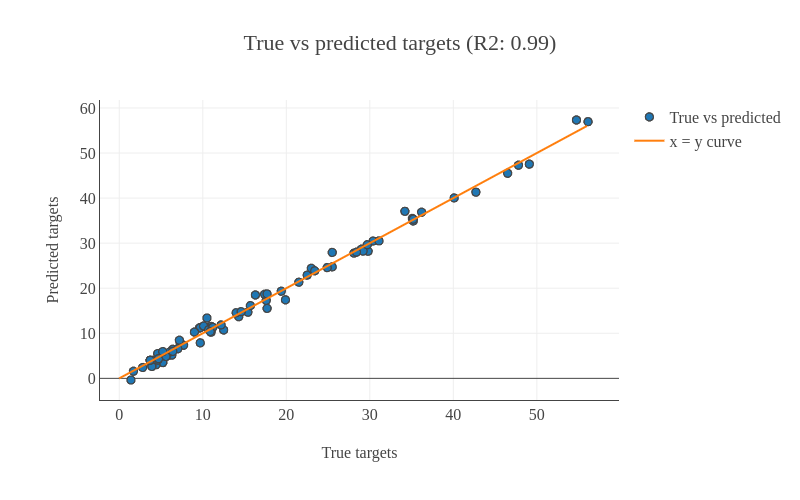 For a good model, most of the points should lie along the x = y line as the true and predicted targets are close to each other. In figure 1, we can see that the points are scattered and do not show any pattern. Therefore, the r2 score is -0.06. But, figure 2 shows a better pattern as most of the points lie along the line and the r2 score is almost 1.0. For RNA-seq dataset, we will compute cross-validated r2 score using the training set and for DNA methylation dataset, we will compute the r2 score for the test set. Figure 1: This shows an example of a bad model as most of the points are scattered. Figure 2: This shows an example of a good model as most of the points lie along the x = y line. The RNA-seq dataset is collected from fibroblast cell lines belonging to 133 healthy patients with age ranging from 1 to 94 years. Skin fibroblasts cells dataset is conducive for age prediction related studies because of multiple reasons - these skin fibroblasts hold age-related damages, contain phenotypic, epigenomic and transcriptomic changes which are age-dependent and it is easy to collect this dataset using non-invasive techniques. Using this dataset, we perform an exhaustive search (also known as grid search) for finding the best features and then apply ElasticNet regressor with 5-fold cross-validation. The r2 score achieved is comparable to the predictions found in the study Jason G. Fleischer et al. 2018. 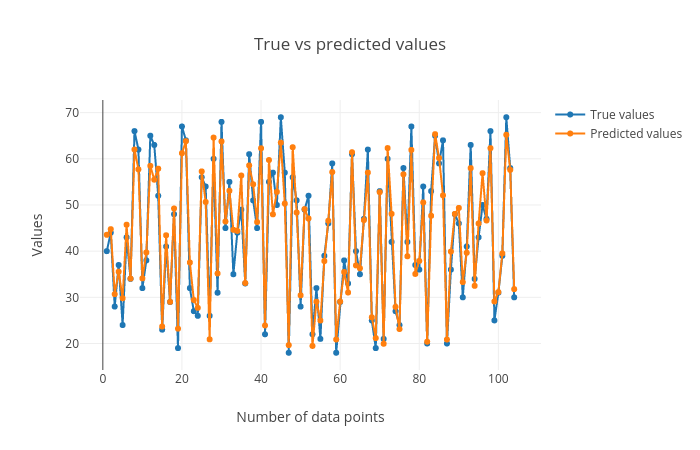 It is a model validation technique which estimates the performance of a predictive model on an unseen data. A dataset is divided into 5 folds and these folds are categorised into training and validation sets. 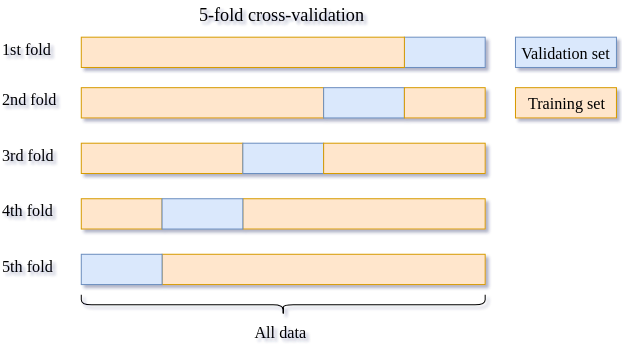 The idea of cross-validation is shown in figure 3. The complete dataset is divided into 5 equal parts. 80% of the dataset is used for training and the remaining 20% is used for validating the performance of training. This is done for 5 folds/iterations, each time the validation set (20% of the dataset) is different. In all five folds, the complete dataset is used for training and validation. The final validation performance is averaged over 5 folds. We proceed to the analysis by uploading the RNA-seq dataset. The dataset has 133 rows corresponding to humans and over 27,000 columns specifying genes. The last column age contains the chronological age of humans. For the validation set, this age column is predicted and r2 metric is computed. Rename the dataset to training_data_normal. In training_data_normal dataset, you might have noticed that it showed 134 rows instead of 133 rows. The first row contains the header information i.e. the description of each column. We can see that this RNA-seq dataset is high-dimensional. There are over 27,000 columns/features. Generally, not all the features in the dataset are useful for prediction. We need only those features which increase the predictive ability of the model. To filter these features, we perform feature selection and retain only those which are useful. To do that, we use SelectKBest module. This approach involves extracting those features which are most correlated to the target (age in our dataset). F-regression is used for the extraction of features. Moreover, we are not sure of how many of these features we will need. To find the right number of features, we do a hyperparameter search (finds the best combination of values of different parameters). It works by setting a different number of features and find out the number for which the accuracy is the best among all the numbers. To wrap this feature selector with a regressor, we will use pipeline builder tool. This tool creates a sequential flow of algorithms to execute on datasets. It does not take any dataset as input. Rather, it is used as an input to hyperparameter search tool (explained in the following step). As a regressor, we will use ElasticNet which creates an age prediction model. It is a linear regressor with l1 (also called lasso) and l2 (also called ridge) as regularisers. 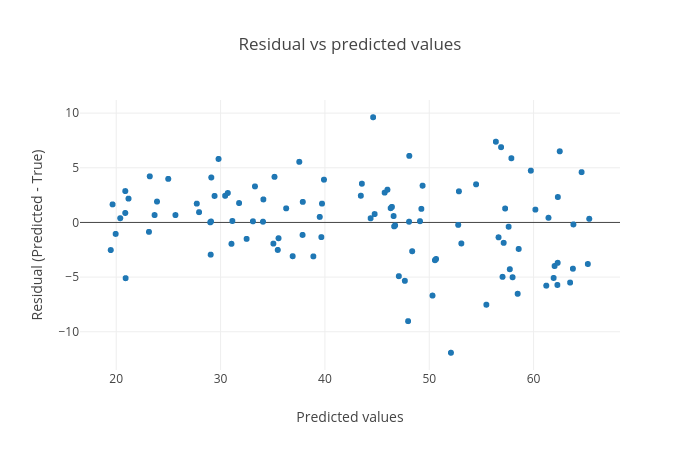 Regularisation is a technique used in machine learning to prevent overfitting. Overfitting happens when a machine learning algorithm starts memorising dataset it is trained upon instead of learning general features. The consequence of overfitting is that the accuracy on the training set is good but on the unseen set (test set) is not good which happens because the algorithm has not learned general features from the dataset. To prevent overfitting, regularisers like l1 and l2 are used. L1 is a linear term added to the error function of a machine learning algorithm and l2 adds a squared term to the error function. More details about l1 and l2 can found here. For our analyses, we will use the grid search approach. It is an exhaustive search which tries out all the combinations of different hyperparameters and ranks these combinations based on a scoring metric. In the random search, the values of a parameter are selected randomly from a given range and the best one is found. Grid search works well for parameters taking categorical as well as numerical values but for the random search, it becomes difficult for parameters which take categorical values. These values of k are chosen to get the best accuracy. We can choose any number (integers) between 1 and 27,000 (maximum number of features in the dataset). We will use only these values (shown above) for k as the accuracy remains the best around these numbers. But, it may vary for a different RNA-seq dataset. That’s the reason why we perform hyperparameter search to find the best values of parameters for any dataset. The default value of normalize is False. We will check both, True and False. The parameter alpha takes a positive real number and its default value is 1.0. For these three parameters, we have 24 different combinations (4 x 2 x 3) of values and we will verify the performance of each combination. The parameter k is used for feature selection and parameters normalize and alpha are used for regressor. There are many more hyperparameters of ElasticNet regressor which are explained in the official documentation of scikit-learn. But, the combination of the above three parameters already gives a comparable accuracy published in the study Jason G. Fleischer et al. 2018. Therefore, we will stick to these parameters. It is advisable to tune all the parameters of a machine learning algorithm for a dataset if no prior information is available about the subset of parameters which works best for the dataset. These parameters have the same description and values in the second part of the tutorial where we will again use hyperparameter search tool. There are different ways to split the dataset into training and validation sets. In our tutorial, we will use KFold which splits the dataset into K consecutive parts. It is used for cross-validation. It is set to 5 using another parameter n_splits. It is set to an integer and used to retain the randomness/accuracy when “Whether to shuffle data before splitting” is True across successive experiments. While setting different values for a parameter during hyperparameter search, it can happen that wrong values are set which may generate exceptions. To avoid stopping the execution of a regressor, it is set to No which means even if a wrong parameter value is encountered, the regressor does not stop running and skips that value. The tool returns two outputs, one of which is a table with numerical results. Please inspect it carefully: the rank_test_score column shows the ranking of different combinations based on the values in mean_test_score column. What is the best mean_test_score value estimated by the hyperparameter search tool? Which combination of parameters gives the best result? How many possible combinations of parameters the hyperparameter search tool estimated? We will visualize the tabular output of hyperparameter search tool from the previous step using parallel coordinates plot of tabular data. There are multiple columns in the tabular output, but we will focus on only a few of them. The output plot has the following legend: the colour-coding is based on the mean_test_score column. You can follow the line leading to the score along every column with parameters’ settings. The columns c5, c6 and c7 are the parameters we chose and c14 is the accuracy column present in the tabular output of hyperparameter search tool. Figure 4: The visualization of the hyperparameter optimisation tool output. What can you notice about the least performing (let’s say least four) hyperparameters’ settings (judging by the plot)? In the plot shown above in figure 4, we achieved an r2 score of 0.73 (last column) with 5-fold cross-validation on the training set. In the study Jason G. Fleischer et al. 2018 as well, a similar r2 score is mentioned for linear regressors (Linear regression and ElasticNet). Moreover, the study also included a customised ensemble regressor which achieved better performance (r2 = 0.81). However, our analysis showcases the use of machine learning tools in Galaxy to reproduce the results published in the paper. In the second part of the analysis, we will use DNA methylation dataset to predict chronological age. One important reason to choose this dataset for age prediction task is that DNA methylation changes with age and this change occurs at specific CpG sites in humans. Whole blood samples are collected from humans with their ages falling in the range 18-69 and the best age-correlated CpG sites in the genome are chosen as features. The dataset is divided into two parts - training and test sets. The training set is used to train a regressor and the test set is used to evaluate the performance of the trained model using the r2 scoring metric. 5-fold cross-validation is used for training. We proceed with the analysis by uploading new datasets. You might want to create a new history first. The training set contains 208 rows corresponding to humans and 13 features (age-correlated CpG sites in DNA methylation dataset). The last column is age. The test set contains 104 rows and the same number of features as the training set. The age column in the test set is predicted after training on the training set. Another dataset test_rows_labels contains the true age values of the test set which is used to compute r2 scores between true and predicted age. Rename the datasets as train_rows, test_rows_labels and test_rows respectively. Check that the datatype of all the three datasets is tabular. We will create a pipeline with pipeline builder tool but this time, we just specify the regressor. Jana Naue et al. 2017 has used random forest as the regressor and we can conclude from this study that ensemble-based regressor works well on this DNA methylation dataset. Therefore, we will use gradient boosting which is another ensemble-based regressor. This is an ensemble-based regressor because it uses multiple tree-based regressors internally and predicts by taking an ensemble of the predictions. It has good predictive power and it is robust to outliers. It creates an ensemble of weak learners (decision trees) and iteratively minimises error. One disadvantage which comes from its basic principle of boosting is that it cannot be parallelised. The pipeline builder tool will wrap this regressor and return a zipped file. Ensemble method uses multiple learning models internally for better predictions. For this analysis as well, we will use hyperparameter search tool to estimate the best values of parameters for the given dataset. We use only one parameter n_estimators of Gradient Boosting regressor for this task. This parameter specifies the number of boosting stages the learning process has to go through. The default value of n_estimators for this regressor is 100. But, we are not sure if this gives the optimal accuracy. Therefore, it is important to set this parameter to different values to find the optimal one. We choose some values which are less than 100 and few more than 100. The hyperparameter search will look for the optimal number of estimators and gives the best-trained model as one of the outputs. This model is used in the next step to predict age in the test dataset. What is the optimal number of estimators for the given dataset? Using the hyperparameter search, we found the best model based on the training data. Now, we will predict age in the test dataset using this model in order to see if the model has learned important features which can generalise on a new dataset. The test dataset (test_rows) contains the same number of features but does not contain the age column. This is predicted using the trained model. In the previous step, we generated predictions for the test dataset. We have one more dataset (test_rows_labels) which contains the true age values of the test set. 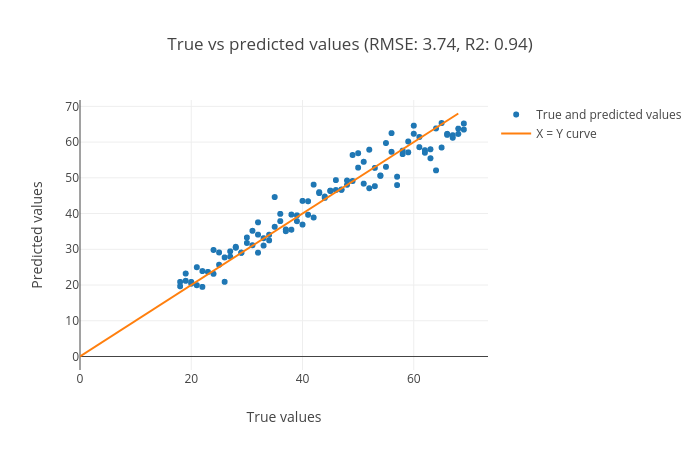 Using the true and predicted values of age in the test set, we will verify the performance by analysing the plots. The tool outputs three html files with the interactive plots. Inspect the plots. What can you say about the predictions? Figure 5 and 7 show that the prediction is good because the predicted age lie close to the true age. We can see in the scatter plot figure 5 that most of the points lie along the x=y curve. It means that the true and predicted ages are close to each other. The root mean square error (RMSE) is 3.76 and the r2 score is 0.94. The residual plot shown in figure 6 is generated to see if there is any visible pattern between residual (predicted age - true age) and predicted age. For a good model, there should not be any visible pattern with the plotted points. The plot in figure 7 shows the true and predicted ages. It can be seen that the points are close. We can see in figure 5 that we have achieved an r2 score of 0.94 and root mean square score of 3.76 for the test set using gradient boosting regressor. In the study Jana Naue et al. 2017 as well, a similar root mean square score (3.93) is mentioned using random forest regressor. The root mean square score shows the difference in the true and predicted age of humans. The r2 score (0.94) is close to the best achievable score of 1.0 which shows that the trained model is good. Overall, the second part of the analysis also shows that using the machine learning tools in Galaxy, we can achieve state-of-the-art predictions mentioned in the recent scientific studies. In our tutorial, we could reproduce the results using machine learning tools in Galaxy as achieved in these scientific studies - Jason G. Fleischer et al. 2018 and Jana Naue et al. 2017. We also learned how to work with high-dimensional datasets, perform hyperparameter search and cross-validation. Further, we can reuse the trained models to make predictions on a new dataset provided that this new dataset has the same features. There are numerous other machine learning algorithms available in Galaxy which can also be tried out on these datasets to verify whether the accuracy can be improved. This material is the result of a collaborative work. Thanks to the Galaxy Training Network and all the contributors ( Ekaterina Polkh, Anup Kumar)!